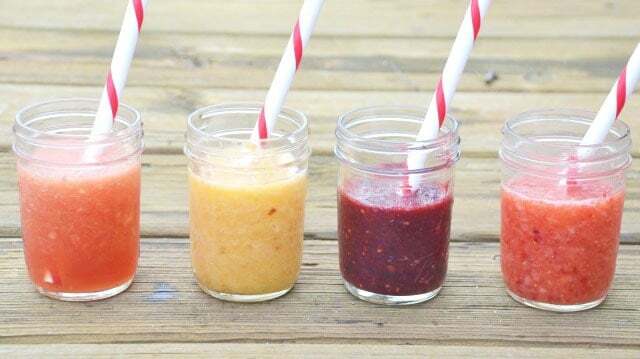 Keep the kids happy and hydrated this summer with these simple fresh fruit slushies. Nothing artificial. No refined sweeteners. Just pure goodness. Bonus: they are allergen-friendly too! As summer rolls in so do the pleas from your kids for frozen treats and drinks. Ice cream, popsicles, slushies. All of the typical ice cream truck fair. It’s hard not to give in. You’re hot and craving something refreshing too! There is a simple solution! 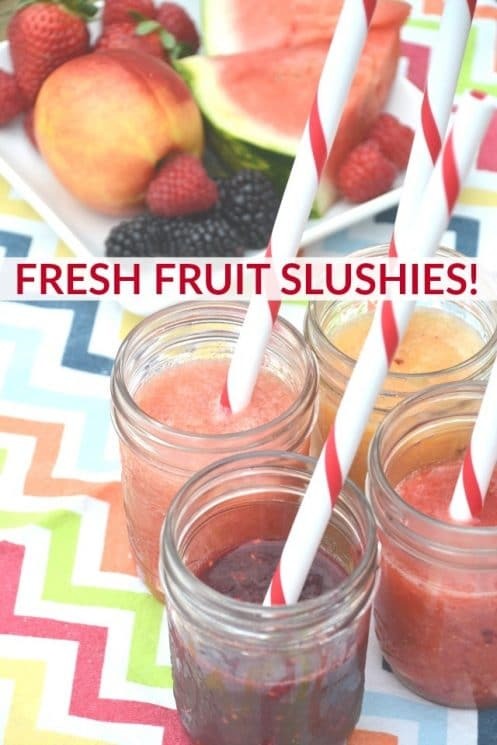 Fresh fruit slushies make the perfect summer drink. Utilize the abundance of fresh produce to create your own treats. Did you just go strawberry picking? 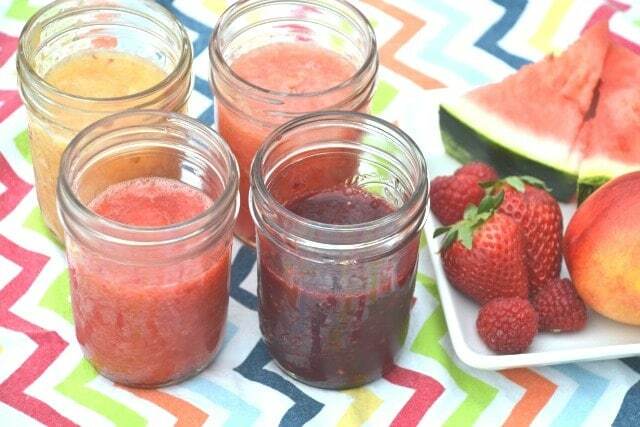 Make strawberry slushies. Is there a huge watermelon on the counter just waiting to be cut open? 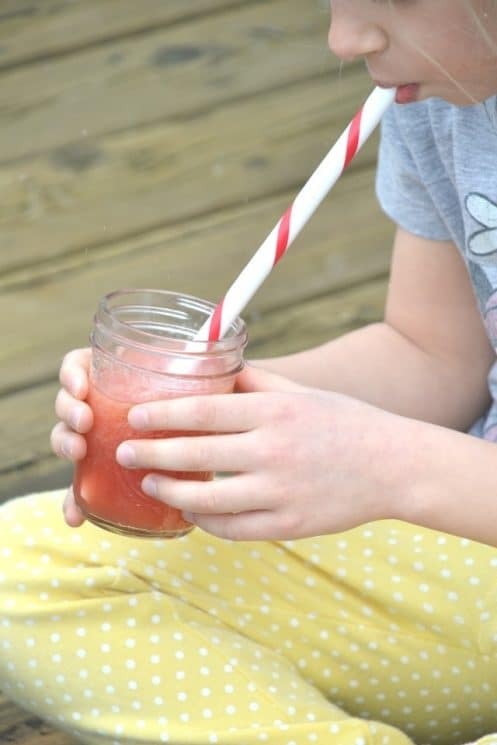 Watermelon slushies are a must (and happen to be my kids’ favorite). 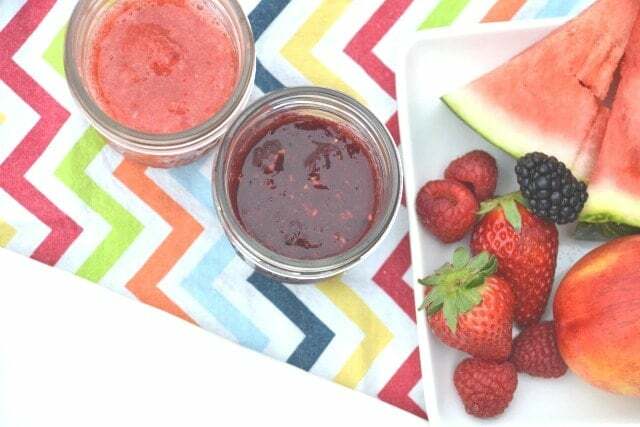 You can use just about any fruit and create a fun drink that not only tastes great but will keep your kids hydrated while playing out in the sun. I like to let my kids pick their own flavor combinations using whatever fruit we have on hand. Blueberries and peaches are in season at the same time. Put them together for a unique slushy that will wow all the neighbor kids. Or how about cherry raspberry? The flavor will beat out artificially colored and flavored blue raspberry any day. We also serve slushies as special treats for birthday parties. They are allergen-friendly and don’t need extra sweetener. So everyone can enjoy them. 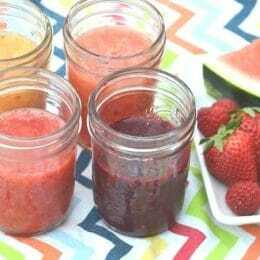 Best of all fresh fruit slushies are so easy to make! Blend fruit, ice and a pinch of unrefined sea salt. In about sixty seconds you have a healthy treat that really can’t be beat. Our Blendtec is one of our favorite appliances in the summer. It makes our slushies the perfect consistency every time. You can make a huge batch, or just a single serve! And the best part about the new Blendtec, is that it tells you if you need to add more liquid to make it blend better. What?? I love that its like my Blender is helping me in the kitchen! The next time you hear the ice cream truck nearby don’t run to the street (and waste your money on junk food). Run to the kitchen. You’ll have fresh fruit slushies in hand before the ice cream truck even reaches your house (or you chase it down!). Your wallet and your body will thank you. Looking for another fruity summer drink? Try homemade pink lemonade! You won’t believe how easy it is to make…and so much healthier too. Combine all of the ingredients in a high powered blender. Blend until ice is crushed but not completely pureed. i tried frzn berries. 3/4c blueberries, pinch of salt and 2/3c ice water. took alot of shaking but my oster finally made a slush. def needs honey or stevia glycerite…i used 2 drops. kids dont like it. i do tho lol but im not a slurpee drinker anyway, ah well. How many calories are in fresh fruit slushies?